This is a web-based product offering a practice management solution specifically for therapists, either single therpaist office or offices with multiple therapists. This product will be commercially available as a subscription service. Dashboard format: The system is all dashboard driven to show lots of information at a glance, then click in different areas to drill down to the details. 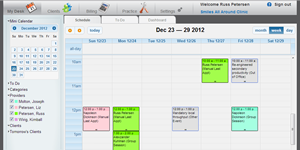 Calendar: Color-coded appointments by therapist and appointment type. Appointment Powerbox: Add charges and payments, make next appointments, and generate insurance forms during check-in or check-out. To Dos: Add tasks to your to-do list. Many to-do tasks generate automatically when appointments are made or completed. Therapists will see their general to-dos as well as their client specific to-dos. Client Management: Manage client personal information like name, address, phones numbers, contacts, and insurance information. Client Forms: Quickly see which required forms have been signed and which still need signatures. Client Portal: Clients are invited by email to complete forms and fill out their portion of the initial assessment online BEFORE their first appointments. Initial Assessment: Comprehensive, including client portions and therapist portions. Diagnosis: Choose from pre-populated therpay related DSM codes. Treatment Plan: Keep a current, up to date treatment plan for each client. Session Notes: The system keeps notes typed by the therapist during the session. Several common formats (SOAP, DAP, etc.) are available. Add to your to do list for this client right from the session notes input area. Client Ledgers: See all account transactions in one place. Enter new charges and payments. Account Status & Aging: See each client’s account balance and aging at a glance. Billing & Insurance: Prepare and send insurance claims, enter insurance and client payments, generate invoices, and see account status separating client and insurance portions. AutoSave and Versioning: Session Notes will save automatically every few minutes. Initial Assessment, Treatment Notes, Diagnosis, and Session Notes will keep all previous versions for insurance review and auditing.